Get Educated, get informed, pass it on. I am very happy to come to this topic about forced vacination in America. I think the same in UK. Here in UK you could be prosecuted if you do not vacinate your child. I had been treatened by the local authorities to vacinate my little child when she started nursery. I really hate vacines. I do not trust them, you do not know really what they are doing, the could even insert microchips or nanotechnology in the body of millions of children. All the vacinations I had been forced to put to my child I believe most of them were really unecesary. A good profit for biological laboratories that create the illness first and then the vacine. How can people can play with peoples lives? Life is just a beautiful holiday, not a hell! JMRobby, I thought vaccinations were voluntary in the UK? 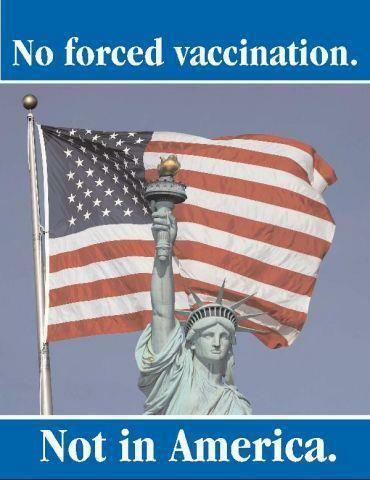 Even though there may be coercion and threats, legally there is nothing they can do to force you to vaccinate (not yet anyway). How did the authorities threaten you? Doesn’t make much sense. Also, you are hardly the only one not to vaccinate your child in the UK. Sounds like you relented and did something you didn’t want to do, even though you weren’t required to do so.